Professor of Urban Studies and Architecture Hilary Ballon passed away on June 16, 2017, at age 61. Ballon, who taught at New York University’s Robert F. Wagner Graduate School of Public Service, was also the deputy vice chancellor of NYU Abu Dhabi. She was a part of the leadership team that oversaw development of the new campus while teaching classes on urbanism and architecture. Her academic research focused on cities and the intersection of architecture, politics, and social life, especially New York City. She was a curator of several exhibitions at the Skyscraper Museum and the Museum of the City of New York (MCNY), with subjects including Frank Lloyd Wright, Robert Moses, New York's Penn Station, and the city's grid system. "Hilary's exhibition and accompanying book on Robert Moses helped re-frame our understanding of modern urban planning," Stephen Petrus, a colleague of Ballon at MCNY, wrote in The New York Times. "Hilary was the rare scholar able to earn the respect of academic colleagues and appeal to the public at large." An author of several acclaimed architecture and urbanism books, Ballon published New York's Pennsylvania Stations, Louis Le Vau: Mazarin's College, Colbert's Revenge (winner of the Prix d'Academie from the Academie Francaise), and The Paris of Henri IV: Architecture and Urbanism, which won the Alice Davis Hitchcock Prize for the Most Distinguished Work in Architectural History and is widely cited as a model for its consideration of urban planning in relation to social, political, and economic forces. As Editor of the Journal of the Society of Architectural Historians (JSAH), she developed a multimedia platform—including GIS and 3D models—with funding from the Andrew W. Mellon Foundation. Ballon served on the Board of Directors of the Museum of the City of New York, the Regional Plan Association, and the Skyscraper Museum, and was a member of the Advisory Council of the Princeton School of Architecture. She was a professor at Columbia University for 22 years, where she received various teaching awards, before joining NYU in 2007. According to the New York Times, Ballon is survived by her husband Orin Kramer, her children, Sophie and Charles, her brother Howard, and her sister Carla Gorrell. Funeral services will be held at Central Synagogue, 55th Street and Lexington Ave., on Monday, June 19th at 1pm. Downtown Brooklyn and the city should ensure that innovative new companies have room to grow through increased—and targeted—commercial office space investment. The city should learn from the 2004 rezoning of the area, which allowed flexible permissive zoning and land use policies and resulted in a surge in development. The city should avoid trying to achieve narrowly defined policy objectives by enacting overly detailed zoning restrictions and prescriptions. The city should continue to invest in innovative public space improvements, such as the Brooklyn Strand initiative and completion of Brooklyn Bridge Park, that make Downtown Brooklyn a more attractive place to live, work, invest, do business, and visit. 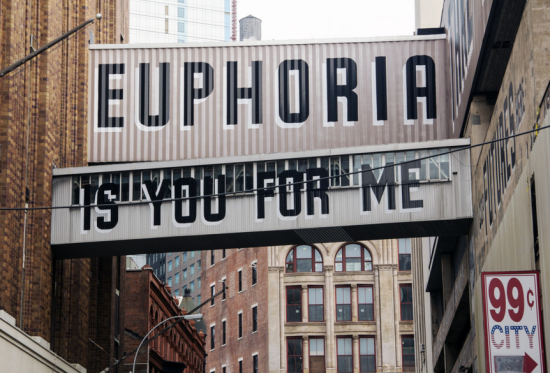 Developers and property owners, non-profit organizations, and the city need to work together to ensure that cultural institutions, arts organizations, and individual artists can continue to play a vital role in the ongoing transformation of Downtown Brooklyn. The city needs to address long-standing gaps in the area’s transportation networks, including lack of transit access to the Brooklyn Navy Yard, difficulties in getting between the core of Downtown Brooklyn and the waterfront, and the scarcity of good options for travel between existing and new waterfront neighborhoods and growing concentrations of jobs along the East River. What do you think: Will these strategies keep the neighborhood on its upward development trajectory, or is the celebratory document failing to consider downsides like the loss of affordable housing and the decimation of independent retail on Fulton Street? This year marks the 104th anniversary of the Triangle Shirtwaist Factory fire, one of the most lethal industrial disasters in the United States. To the shock and delight of labor activists and descendants of workers who died in the fire, New York State Governor Andrew Cuomo announced yesterday that the state would provide a $1.5 million grant to Remember the Triangle Fire Coalition (RTFC) to build a memorial at 29 Washington Place, the site of the former factory. The grant, culled from state economic development funds, will cover the full cost of construction, the New York Times reports. The building that housed the factory still stands. Now owned by New York University (NYU), it houses some of NYU's biology and chemistry labs. Due to its significant place in labor history and the women's rights movement, the structure is a New York City and a National Historic Landmark. In 2013, New York-based architects Richard Joon Yoo and Uri Wegman won the memorial design competition sponsored by RTFC. Yoo has his own firm, Half & Half Architecture, while Wegman practices at Matthew Baird. Their design,“Reframing the Sky,” is sensitive to the historic architecture while bringing visibility to labor issues, past and present. The names of 146 victims will be inscribed on steel panels 13 feet above the sidewalk. At about knee height, a mirrored steel panel will reflect the etched names above before shooting up the side of the building to the eighth floor, where the fire originated. The lower panel will also feature a description of the blaze and its aftermath. The insufficient fire safety and emergency exit measures the disaster exposed strengthened the organizing of the International Ladies' Garment Workers' Union (ILGWU) and prompted building code and fire prevention reforms nationwide. Mary Anne Trasciatti, president of RTFC, stated that the organization will raise an additional $1 million to maintain the memorial. The money will also fund scholarships for the children of present-day garment workers and students pursuing labor history. As was widely expected, NYU cleared its next to last major hurdle yesterday when City Council approved the university's expansion plan. The only thing left to do is to obtain the assured signature of Mayor Bloomberg. Amidst cries of "Shame!" coming from the public seated in the balcony, the council passed a plan that was reduced in size by 26 percent from the original proposal after all the ULURP parties had weighed in. It was a week of devastating lows and mild highs for Community Board 2. With NYU virtually assured of getting their 1.9 million-square-foot expansion plan through City Council next week, in spite of vigorous local objection, the mood at last night’s executive board meeting was decidedly grim. 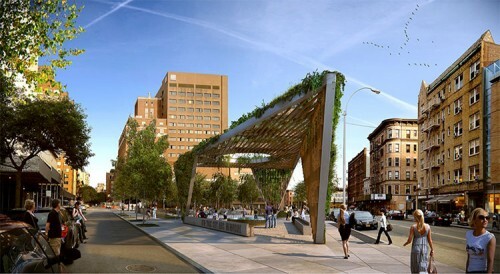 But a new design for the AIDS Memorial, to be incorporated into the proposed St. Vincent's Hospital Park across the street from the former hospital site in Greenwich Village, offered some hope. The new design was in response to a demand that the designers incorporate community input, providing hope for some that that the Uniform Land Use Review Procedure (ULURP) was not a waste of time. "With ULURP being ULURP, I didn't think this would happen," Village resident Robert Woodworth said of the memorial designed by Brooklyn-based studio a+i. The vote was nearly eclipsed by a visit from Council Member Margaret Chin who came to explain her position on NYU to the polite but angry crowd. Board Chair David Gruber didn't mince words, telling the Council Member that the vote earlier this week was "monumentally tragic" in its disregard for the community. The frustration with NYU made the memorial's evolution that much more poignant. Community member Steve Ashkenazi drew a direct comparison. "This group has responded to the community," he told the crowd. "It's a beautiful, relevant design." 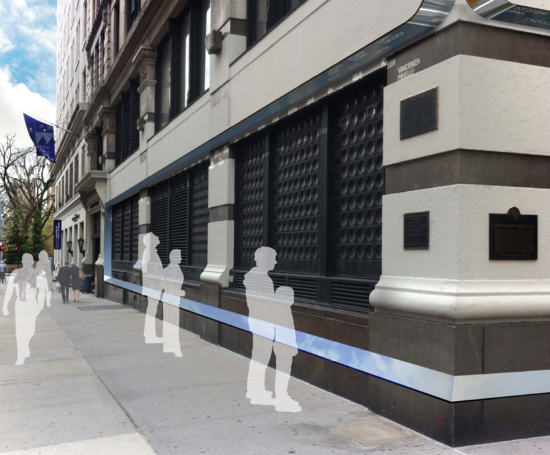 Strange as it may seem, the memorial and NYU do share commonality, both the modest AIDS Memorial and NYU's huge expansion plan bid high in their initial proposals and eventually whittled the scale down after negotiating with the board. Indeed many had thought that a+i's winning design resulting from the ideas competition, sponsored by Architizer and Architectural Record , would be realized as it was presented, encompassing the entirety of the triangular park. But as it tuned out, site-owner Rudin Management had a plan of their own for a much smaller park. Under the banner of the Queer History Alliance, activists rallied media support for an AIDS memorial on the site, even as the board was trying to influence the design underway by Rudin's landscape architect M. Paul Feiedberg. In the process the site for the public park evntually expanded to encompass the entire triangle, with 17,000 square feet set aside for the memorial. The memorial's planted overhead canopy will mimic the angles formed by West 12th meeting Greenwich and is supported in turn by three inverse triangles. Cross beams of planters will run the width of the triangles, holding English Ivy, Virginia Creepers and Honeysuckle. Slats running opposite the planters will hold a galvanized Greenscreen grid, giving the vine a surface to grow on. A large oculus will hover above a reflective water element and granite benches will run along the north and south border. Under foot, carved poetry texts find their way in a series of large intersecting circular pavers. Lighting, planting, and irrigation systems include a detailed plan for maintenance. The memorial's co-founder Chris Tepper told the crowd that the compromise, which led to a much smaller memorial than the winning proposal presented last spring, still meets the group's "policy goals." He promised that he and co-founder Paul Kelterborn would remain committed to raising the $2 million for the memorial as well as $500,000 for a maintenance fund. In a first exclusive look, New York Magazine's Justin Davidson gave the project a thumbs up. With such media savvy, there is little doubt that the the group, now officially called the AIDS Memorial Park, will have trouble raising the funds to build. 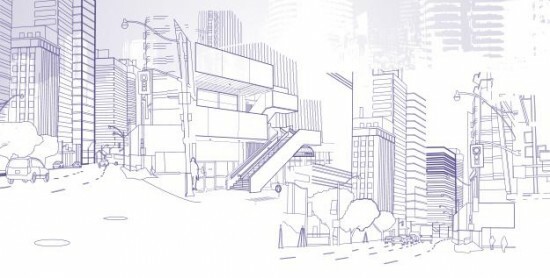 After two weeks of negotiations between the New York City Council and NYU, the Council Land Use Committee and Subcommittee on Zoning voted today to approve the modified version of NYU's 2031 plan. The plan will move before the full Council on June 25th for a final vote to give the univeristy the go-ahead to begin constuction in Greenwich Village. The nine member Zoning Subcomitee voted unanimously to approve the plan, while Land Use approved it 19-to-1. Though many expressed reservations, Council member Charles Barron cast the single “nay” vote, arguing that NYU’s development plan and the opinion of Greenwich Village’s Community Board 2 are “diametrically opposed.” While Barron said that his fellow council members would regret their votes, his colleagues seemed more hopeful. Council member Margaret Chin, who represents the neighborhoods in which the expansion will take place, said that the modified plan “will not overwhelm the community,” and that it is an appropriate balance between the integrity of Greenwich Village and the needs of NYU. Changes to the development plan include a 20 percent overall reduction of expansion, bringing the gross square footage from 2,130,000 to 1,918,000. This cutback will be concentrated in two locations: on the northern section of the Zipper Building, the bulk of which has been shifted from the corner of Mercer and Bleecker streets towards Houston, and at the Mercer street Boomerang building, which has been reduced in height from eleven-stories to a squat four. 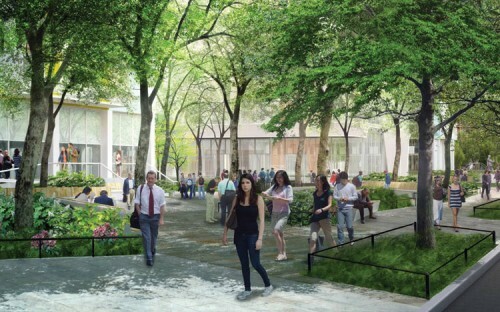 Additional modifications include increased open space, more community-dedicated spaces, financial commitments towards these spaces, and the creation of open space and construction oversight committees to help ensure that NYU follows up on its promises. As expected, Greenwich Village community activists were present to express their dissatisfaction with the approval of the modified plan. Andrew Berman, Executive Director of the Greenwich Village Society for Historic Preservation stated that the modified plan was “hardly a compromise,” and that the proposed expansion was still “grossly over-sized.” While it now looks as if NYU will surely get the go-ahead at the vote next Wednesday, council member Vincent Ignizio reminded those in attendance that the challenges that face NYU and Greenwich Village are far from over. Speaking directly to the representative of the Univeristy, Ignizio stated that “now the real work begins for the community and for you, NYU. This community clearly has an issue with you, and now is your opportunity to begin a new day, wipe the slate clean and say we are going to be responsive to them.” For additional information on the NYU 2031 plan, click here. The Zoning Committee of the New York City Council is holding a hearing today for NYU's proposed expansion. It is the last stop on the ULURP tour that has garnered some of the most contentious debate in a neighborhood that has seen more than its share of zoning upheaval over the past year. Usually the council votes in agreement with the council member representing the district. As such, all eyes were on Council Member Margaret Chin, whose Downtown district includes the Washington Square area where the expansion is being proposed. While Chin said that the plan is "unacceptable as it stands" she didn't outright reject the plan. According to The Wall Street Journal, Chin is casting a critical eye on the so-called Zipper Building on the southern super block. As the university agreed with City Planning to eliminate a hotel in that building, it seems likely that's where the ax will fall. Borough President Scott Stringer, whose role is advisory, said that he had already negotiated a reduction in the Zipper Building, but City Planning set aside his suggestion. This morning Chin added affordable housing to the list of her desires, opening up yet another round of arm twisting for NYU. Whether the housing would be included on the site or within the district is unclear and whether that agreement would be binding will probably be a sticking point for the ever-vigilant Villagers. Open space was also on the Council Member's radar, but her mention of preserving park space along the DOT strips along Mercer and Laguardia streets was already mapped out by Planning. However, Chin's mention of the "thousands" of jobs that the project will bring indicates another mildly altered version of the plan will move forward. For their part, NYU stuck to the script. As an example of a university busting at the seams, President John Sexton noted that the university's library should seat 8,000 but could only accommodate 3,000. He countered claims that expansion was an attempt to fill college coffers with cash from more students, saying the expansion was physical in nature and would not correspond with a substantial growth in the student body, which he predicted would only increase by half a percent annually. He also defended the contention that the university couldn't afford the project. "We wouldn't be taxing our budget any more than we have over the last then years," he said. 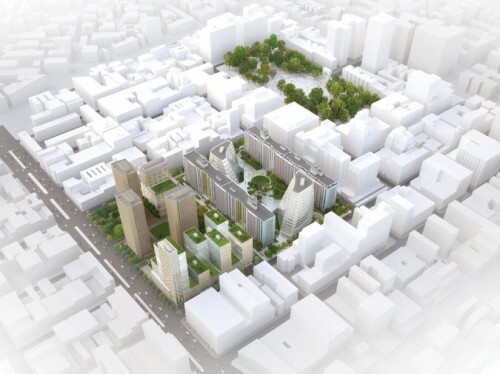 In a 12 to 1 vote this morning, City Planning approved NYU’s Core expansion plans for two superblocks in Greenwich Village designed by Grimshaw with Toshiko Mori and Michael Van Valkenburg. In slow and deliberative pace, City Planning Commissioner Amanda Burden read from a prepared text that included several aesthetic and few programmatic changes to the proposed plan. The new plan will reduced the size of the overall project from 2.47 million square feet to 2.1 million. All four proposed buildings were approved with tweaks here and there. Both of the so-called “Boomerang Buildings” will be reduced in height that will not exceed the slabs of the Washington Square Village buildings that frame them. The “Zipper Building” will not be allowed to include a hotel component as part of its programming. The proposal for a temporary gym was also nixed. Of the changes to the nearly four acres of public space the most significant is that the university will not be permitted to build beneath the green strips on the northern superblock, thus saving the mature trees that are on the site. The proposed light wells that allow natural light to flow to the massive subterranean structure will be reduced on the Mercer Street Boomerang Building so as to create more open space at grade. The creation of the an Open Space Oversight Organization will be set up to insure public oversight, and allow for future modifications, “especially as the space is not to be built until 15 years from now,” said the Commissioner. As the lone commissioner to vote against the proposal Michelle de la Uz praised the university’s “laudable efforts,” but noted that it was done to address the impression that “their growth thus far has been haphazard and insensitive.” She also voiced concern, shared by many in the community, that the programming for the northern superblock is still too vague. She added that a lack of affordable housing and a public school were also troubling. In the end Uz concluded the project’s size has not dramatically changed, as indeed it hasn’t. 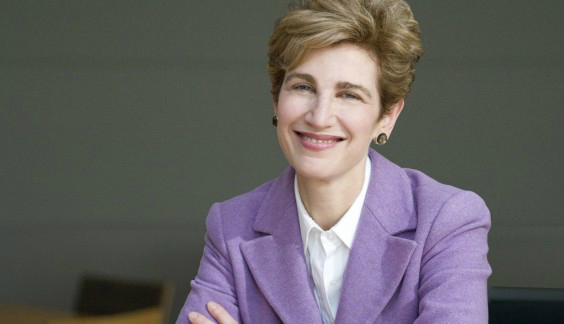 For their part NYU seemed pleased with the outcome, with NYU’s vice president of government affairs Alicia Hurley finding most of the changes as “not an impediment” to the university’s overall goals. The one building that seemed to get lost in the shuffle was the building replacing the Morton Williams super market on the southern superblock. That building is supposed to house the public school which sparked Commissioner Uz’s concern. Hurley said that ongoing talks with the Department of Ed are going well. “They are interested,” she said. After the hearing, Andrew Berman, executive director of the Greenwich Village Society for Historic Preservation, employed the shoehorning-the-Empire-State-Building-into-the-Village phrase he’s used throughout the process to describe the plan. He did not seem particularly surprised by the outcome, saying that every major development application that went before this commission was approved. Still, he held out hope that the next stop for the application at City Council will put a halt to the project. “Hopefully City Council will show some independence from the mayor,” he said. As was largely expected following comments from Manhattan Borough President Scott Stringer's office leaked to the press last month, officials from NYU announced that the university has agreed to shave off 370,000 square feet from their 2,275,000 square foot expansion plan, The New York Times reported. 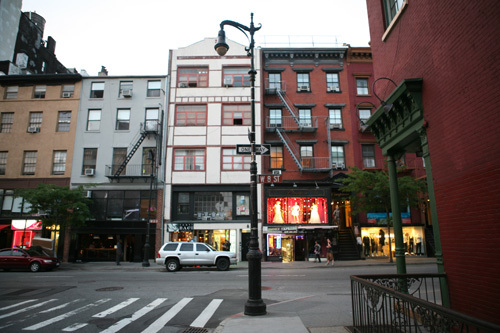 In a telephone interview with AN, Andrew Berman, of the Greenwich Village Society for Historic Preservation, said that even with those changes the project is still out of scale for the neighborhood. Berman added that he was disappointed that the Borough President (BP) didn't hold public meetings for the ULURP, as was done for the Columbia University expansion in Morningside Heights. "If there was ever a ULURP to hold a public hearing for, it was this," he said. For the past few months, several NYU watchers have been speculating that the university was hedging its bets with a plan that included more space than needed so as to reach the Goldilocks-just-right moment negotiated by the BP's office today. The breakdown doesn't change the overall character of the design. The comparison of plan being the "size of the Empire State Building" still somewhat applies, though less 17 percent (NYU documents put it closer to minus 14%). The changes leave the underground complex on the north block fairly intact. 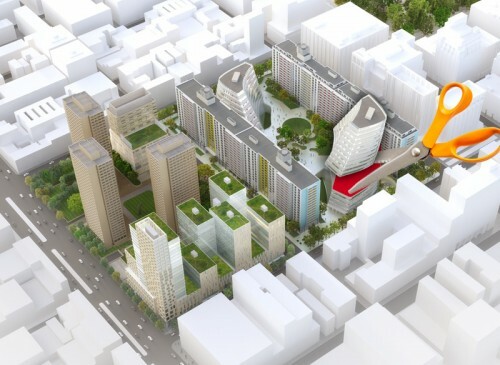 The so-called Kimmelman Plan, which called for the elimination of the Grimshaw/Toshiko Mori Boomerang buildings, was ignored. Instead, the university proposes to take 85,000 square feet off the top, but the 770,000 square feet below grade will remain. On the southern superblock the new plan proposes moving the Zipper Building farther back from Mercer Street, to allow more light for neighbors across the street. But the original plan, refined by Michael Van Valkenburg, would have in any case opened up a dreary alleyway between the Zipper Building and I.M. Pei's Silver Towers, thus creating a more generous approach from Houston Street to the courtyard featuring Picasso's sculpture Portrait of Sylvette. Finally, the proposed 14-story building set to replace the supermarket on the northwest corner will be cut in half. Whether this makes much of a difference in the overall pedestrian influx is doubtful, as that building included a proposed public school that the Department of Education never agreed to use. A controversial hotel is still in the mix, for now. The revised plan will be presented to City Planning today, but the big brouhaha public hearing will take place on April 25 at 10:00 A.M. Territorial ironies aside, the commission has wisely relocated the public meeting to the more spacious environs of the Museum of the American Indian at Bowling Green.